In this second video on understanding weight shift in the golf swing, I discuss specifically the "right hip line" and how understanding what it is will help you understand how the weight shift and hips work in the golf swing. For many golfers, they will find that this simple video helps them understand why they've always struggled with getting into the proper, powerful position at the top. Unfortunately, numerous golf instructors teach their students how to do the exact incorrect movements I demonstrate in the video and it has hurt many golfers games and their wallets. This video will dispel some of those myths and show you to properly transfer your weight for maximum power and efficiency. With the weight shift in the golf swing part one video, I talked about just how critical weight shift is during the golf swing. There, I was specifically talking about during the golf downswing, because that's where all the magic happens. That's where the pay off is. You can do a lot of things wrong in the back swing, but if you screw up the down swing and you screw up the sequencing of it, the ball's not going to go where we want it to. It's critical that you understand how important it is to shift your weight correctly during the back swing to set up a proper weight shift during the downswing. The key is if you look back at the video I did on how to swing from the ground up, right ... It's a term we've heard a million times, and I go in depth about how critical it is to load yourself up on the right side during the back swing. What that's going to do is help give you the momentum and the stored energy to help you shift back to the left. So many golfers are terrified of this term of swaying. They don't want to sway. They've heard that they don't want to have their hips sliding all over the place, and so what they do is they lock themselves in place, and then they can't move anything except for up top. Their legs can't do anything to help facilitate power in the swing, which is one of your primary sources of power from the ground and from your big muscles in your trunk, but also sequencing. Sequencing, as I talked about on the part one video, helps you maintain lag, helps you get into a proper impact position, helps you set the club in play during the down swing. It's critical that you understand how to shift to the right and first of all understand that it's okay and you need to shift to the right. It's necessary for power in the swing. Think about any other sport you've ever done or seen in life, whether it's a hitting or throwing sport. All of them involve weight shift. You've never seen a baseball player throw a ball like this without shifting their weight or shifting their weight to their front foot and then tilting back. None of that makes any sense. It's not an athletic motion. Every sport follows the same sequence. You're going to load your weight up to your back foot, and then you're going to transfer your weight to your left foot, and then you're going to pivot your hips, and then you're going to throw the ball. Same thing if you're hitting. You're going to have your weight loaded up on your back leg, and then you're going to go to your left, and then you're going to rotate your pelvis, and you're going to produce power from your trunk. So many people are so afraid of swaying and getting into this reverse pivot motion, that they don't allow themselves to shift to the right. Then once I tell them, "Hey, it's okay. You need to allow yourself to shift," then they start sliding too much. How do you find the balance? Where's the medium spot? Well, the right hip line is your check point here. You want to imagine that if you drew a line ... Of course, if you're using our swing analyzer software on the site, you can video yourself and draw lines on your hip, which I highly encourage you to do, so that you can see what's really happening. For the purposes of this video, I'm going to put a golf shaft over here. What I'm going to do is as I make my back swing, I'm going to try and keep that shaft from ever moving backwards away from the target or toward the target. As I do this, you'll notice that my right hip line ... This is this outer line here ... appears that it never changes direction away from the target or toward the target. Now, if I slide my hips too much and I don't rotate them, you'll see that I'm moving into that right hip line. This is a slide. We don't want this. This is a very weak, awkward, unathletic position to be in. Very hard to shift your weight back to the right. I've let my weight move to the outside of my right foot, and I'm in trouble here. It's a very weak position to be in. What I'm trying to do is let my weight push my ankle into the ground and keep it centered over my foot. I never want to roll to the outside of my foot. This is a death move. You've got to allow yourself to move into the middle of your foot and load your ankle without this hip sliding out this way. The other problem that I see all the time is people ... Again, this goes back to being afraid of swaying, so what they do is they try to not move their hips at all in terms of laterally. It's okay to move laterally, and so they just turn and they stay really centered, and so their hip moves toward the target. The reason is your hips are turning during the back swing, obviously. What you're really doing to keep this hip in position the whole time is that you're moving laterally while turning at the same time. That makes it look like it didn't actually move laterally at all. Because it's turning back, it's moving away from the target line, it makes it look like it's staying in the same position. I've also talked about imagining that you're creasing the pant leg in your groin area where your hip flexors are right here. If you imagine that you're turning into this right leg and just increasing pressure on the right foot, if you're one of those people that tends to slide. Think about increasing pressure on your right leg and creasing that pant leg. The opposite of that would be letting your right leg rotate out. Let your weight go to your outside of your foot, and you'll see now that my pant leg is not creased because I've let my leg rotate with me. I don't want this leg to rotate out very much. You can imagine that your right knee is pointing at the ball the whole time. If I keep it there, as I start to shift this way while turning into that right leg, my pant leg creases and my right leg stays as an anchor. It's a rock to allow me to load up and store a lot of energy in the back swing. You don't want to sway, but you do have to shift laterally while you're turning your hips. That will get you loaded up properly to make a powerful shift in the down swing. JOIN OUR 352,880 MEMBERS AND GET INSTANT FREE ACCESS TO DOZENS OF VIDEOS! Get Your Free Membership to Finish Watching "Weight Shift Part 2 - Right Hip Line" Right Now! Join our 352,880 members to watch this video and 200+ more! Want to Watch the Rest of This Video? 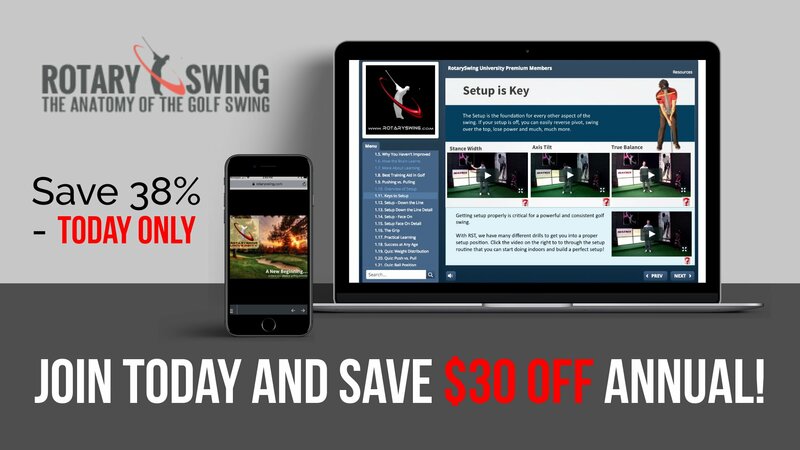 Join RotarySwing today with our lifetime guarantee and get immediate access to this and 500+ other instructional videos!